How can I change and customize the text of my survey? You can customize the font, font size and font color of your survey two different ways. If you need to specifically change the text on one part of the survey, click on the text to be edited and then select the desired size and color for the text from the toolbar. By default, the style of text is the same as the settings from Visual Settings. To change the overall text for a survey, click on Visual Settings in the Design menu bar. There you will find the ability to change the color of question and answer choice text under Colors, as well as the ability to set the font type, size and style throughout the survey under Font. Please note: If you find that your some of your question text is still appearing different from the settings you applied, consider removing the format from those questions. Often, if you copy and paste the questions directly from a document, some of the formatting code from the document is also copied with the text, making it appear different. To remove any additional formatting, simply highlight the words and click on the Tx button within the text editing toolbar. How can I change the title of my survey? While editing your survey, click on the Options icon on the Design menu bar, then select Survey Details. Here you can edit Title, Description, and Owner. If you are looking to change the text that appears at the top of each page of your survey, then you might be looking to change the Header of your survey. To edit the header, simply click on Designer, and you’ll see the header at the top of each survey page. Click to edit and remember to save! How do I add an “Other” option to my question? To apply an “Other” option, simply check the box that says “Include ‘Other’ text responses” found at the bottom of your answer options when editing a question. How do I add a comment or statement to my survey? To add any one-time introductory text, instructions, statements, or comments to your survey, use the Descriptive Text! Simply drag and drop, then enter in your text. Remember to save! How do I add a “thank you” message to my survey? How can I update contact information in the “thank you” message? Within Design, click the Options icon on the Design menu bar. From the dropdown menu that appears, click on Thank You Page. In response to the question at the top [‘Would you like to display…?’] toggle this option on. Enter or update content in the field below, then Save. How do I add a header/footer to my survey? Remember that a survey header or footer will appear on every page. If you want to add text in just one location, use a comment. From the Designer page, click the + Survey Header option at the top of any page canvas or the + Survey Footer strip at the bottom of any page. Enter your header/footer content in the text boxes and click Save. Can I insert a graphic in the footer of my survey? Yes. You can insert a graphic in the footer of your survey using HTML code. The graphic will need to be hosted on the internet in order for you to accomplish this. Please Contact Support for more details. Can I insert a graphic as part of a survey question? Yes. You can insert graphics in your many survey question types as well as answer options. Click on the Add Media icon above the Question Text Box and Answer options. 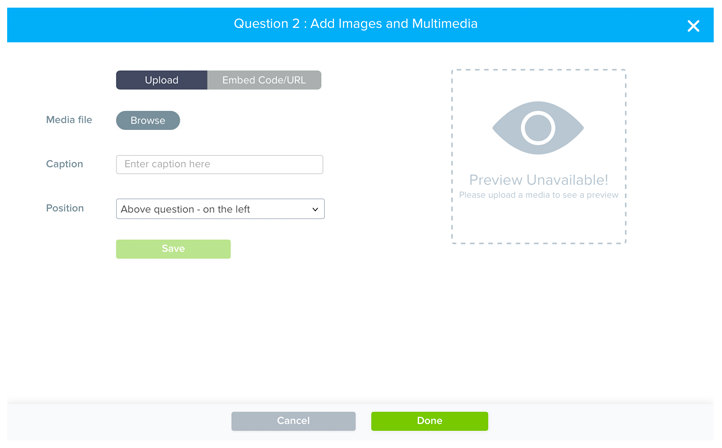 Choose how to add graphics – either Upload or Embed Code/URL. To upload, browse to locate a file on your computer. To use an online image, click Embed Code/URL, then enter the link/code. Choose whether to provide a caption, as well as the relative position of the image. If you would like someone who clicks on the image to be redirected to another page, enter the URL of that page under Redirect URL. Can I add audio or video files to my survey? Yes. Audio and video files can be used in your survey, based on your account type. Follow the instructions above [Can I insert a graphic as part of a survey question?’] to browse and select an audio or video file. How do I direct my participants to questions that only apply to them? You can direct your participants to specific questions or pages by using logic options, including Question Display Logic and Branching. Branching allows you to guide each participant page by page along a path of specific questions based on answers the participant has already chosen from previous questions. Question Display Logic allows you to show or hide follow-up questions based on a participant’s earlier responses, and can be used on a single page or across pages. To learn more about using logic options within your survey, check out this video. What is the difference between ranking and rating questions? RANKING: A ranking question asks the participant to arrange each item listed in order of preference. For example: Rank your top three favorite types of music. Ranking questions can also be used with Answer Constraints to ensure participants are focusing their attention on their top choices rather than ranking every single item in a long list. RATING: A rating question is a single-select question that asks the participant to choose a single point on a scale that indicates a level of agreement, satisfaction, etc.. For example: Please rate your level of agreement with our new policy. In addition to providing qualitative answer options (Strongly Agree, Agree, etc. ), rating questions allow you to assign quantitative weights to each answer (Strongly Agree = 5, Agree = 4, etc.). As a result, your reports will show both frequency (how many times each answer option was selected) and an average weighted score. Why are there extra line breaks in my survey question? While entering the question text, you may click on the ‘Paste from Word’ icon near the right end of the editing bar. Paste your text into the box, then click OK. While editing the question text, click on the Source icon at the far right of the editing bar. You may remove any extra character seen here, then click the Source icon again to ensure the display is correct. Can I switch between question types?